The story about Jesus, his death and resurrection is called the Gospel. And hearing the Gospel message is the first step everyone takes in the Biblical plan of salvation. I am unaware of any Christian group which does not recognize that there is a process one goes through on the way to salvation. Sometimes we illustrate this process using clever metaphors. These wonderful illustrations are designed to help us understand the plan of salvation clearly. One popular metaphor is called "The Romans Road." You may have heard of it. Using the book of Romans, in the Bible, we can trace out a pathway which leads to salvation. The metaphor we will use to illustrate the Biblical Plan of Salvation, is not a pathway but a staircase, as I mentioned in the last lesson. Just as there are steps we travel on the Roman Road, there are several steps on our staircase which every person takes on their journey to salvation, or the forgiveness of sins. Here's the illustration of our metaphor. We have already identified the first step, so let's label this first step, "Hearing the Message." Every person in the history of the world, who has ever come to know Jesus, has taken this first step. This should be pretty obvious! If you consider yourself a Christian, that means you heard the Gospel, you made a conscious decision to respond positively. Perhaps you were in a church, listening to the radio, watching the TV or a friend brought the message to you. You decided to make Jesus, Lord of your life. You may remember that day clearly. You made a decision. You accepted the message; you didn't reject the message. And guess what, that would be the second step in the Biblical plan of salvation. Let's label the second step, "Accepting the Message." Again, this is pretty obvious. For someone to be saved, they must accept the Gospel message. Rejecting it would get them nowhere! For many people, it is at this point, as they surrender their will to Jesus and make Him Lord of their lives, that they might feel an inexpressible joy and relief as they understand they have crossed over from a dark life of sin and have been born again into the wonderful light of salvation. They are comforted by the fact that they will never walk alone again, they will have their Lord and Savior walking with them. The point in time when this occurs is what we previously called a "salvation experience." 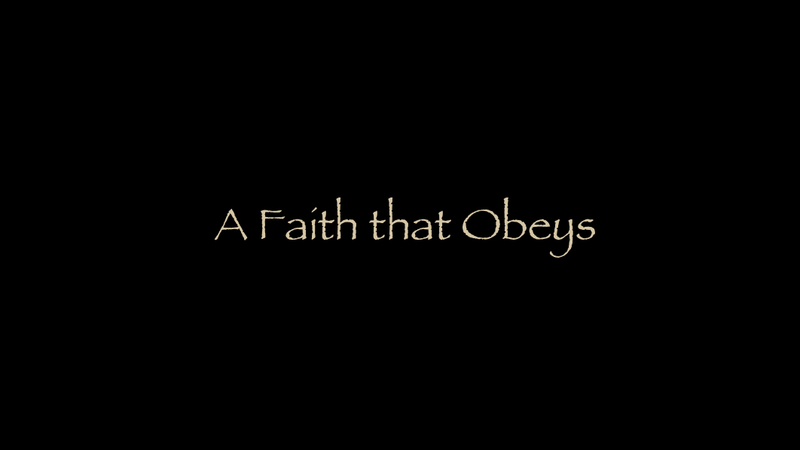 The goal of this series, "A Faith that Obeys," is to identify the exact point in time when this "Salvation Experience" occurs. Most people who call themselves Evangelical Christians can point back to a specific point in time... in the past... when a "salvation experience" happened for them. This is the moment in time which they would point back to and say, "That's when and where I became a Christian." or "That's the point in time I was Born Again." "Lord Jesus, I recognize that I am a sinner and I need you in my life. I know you are standing at the door of my heart, knocking to come in. Lord Jesus, right here and right now, I invite you into my heart. Save me from my sin and help me live my life for you. Amen." For the vast majority of people with an evangelical background, this, or something very similar, is how they became a Christian, they gave their life to Christ or "Accepted Christ." Can you think back to an exact time and place when this happened for you? Mark that clearly in your mind. Jot it down on a sheet of paper. By the way, this was my experience at about 22 years of age. I prayed the "Sinner's Prayer" with a neighbor friend, accepted Christ and invited Jesus into my heart. Most folks believe, when someone accepts Christ, they are saved; which means, as we have discussed, their sins are forgiven and they begin their new life in Christ. Let's mark a "Line of Salvation" right above the second step on our illustration to indicate that the forgiveness of sins occurs at this point in time. Remember, the forgiveness of sins equals saved and saved means this is the exact point in time you were born again and became a Christian. Born again = Christian = Saved = Sins are Forgiven, it's all the same thing. Sometimes, if someone accepts Christ through a radio broadcast or television program, they are encouraged to join a local Bible based church in order to experience and be strengthened by the fellowship. New converts are encouraged to read and study their Bible and to live a life that honors God. In many churches, these "babes in Christ" are told that water baptism is a very important command of Jesus and they should be baptized as soon as possible... in obedience to the Lord, since they are now been saved and their sins have been forgiven. Sometimes new converts are taught that water baptism is their first real act of obedience as a new Christian. This is a general overview of the modern plan of salvation which is promoted and used by most of the evangelical world today. Different churches and denominations use different words or phrases and make adjustments to this plan in various ways but basically, this is the plan. This might be summed up as, "accepting Christ for salvation." When you believe or accept the message and receive Christ as savior, you become a Christian and your sins are forgiven. Now, there's just one problem with the modern plan of salvation. It's not the Biblical plan. The Bible never teaches us to simply and only believe in Christ for our salvation even though there are scriptures which seem to support that view. It never teaches us to say a prayer to be saved. It never teaches us to ask Jesus to come into our heart. It does not teach that our sins are forgiven as a result of decisions we make or actions we take outside of Biblical obedience. We are not saved by works, things we do. The Bible never uses a phrase like "accept Christ as your personal Lord and savior." Does this surprise you? There is much more to the Biblical plan of salvation than these first two steps. Something horrible has happened to the plan of salvation over the last millennia. It has been changed! This modern plan is still very very close, but there are critical things missing and out of place. Frankly, this shouldn't surprise anyone. Listen. If Satan wanted to offer a counterfeit plan, why would he create a lame one? Remember my $100.00 bill drawn with a green crayon? No one would accept that! Satan's counterfeit would need to be so good and so convincing, so very close to the Biblical plan, that it could trick anyone who is unwilling to compare the plan they learned and followed to the Biblical plan of salvation... once you are made aware of it. Satan doesn't deny the plan, he simply changes some things around, just a little bit, then provides a warm environment in which his lie can grow! Satan's plan is an absolutely delicious plan served up with very real emotions of joy and love, warm physical feelings and often, some very real experiences. All these are expertly crafted to confirm his lie. I hope you are a little concerned at this point. Once again, I'm going to ask you to step back if you're feeling a little emotionally charged. I am merely asking that you think about, pray about and evaluate the things you are learning. But please, never for a moment think that any of us could not be deceived by that snake. Remember, it has always been his trick to twist or question God's commands from Eve's experience in the Garden... to Jesus temptation on the temple roof.... should we be so naive to think he would not try to twist our understanding of the Bible. The only way we can possibly know God's will and his plan of salvation is to carefully, diligently, study His word keeping a humble attitude and a heart which is open to new understandings. You know. A counterfeit is never effective unless it's very convincing very full of proof! But then you're not a person who would allow your emotions, feelings or even some very real experiences to be more important and more convincing than the scriptures, are you? Remember. I said this would be challenging. It was for me. I told you I had made a very real, very sincere, very solid decision for Christ as a young adult. But I had not yet followed the Biblical Plan of salvation. I was still in my sins and had no power over them at all. I was a very nice, very kind, very loving believer in Jesus, but I was not a Christian. I had been deceived and did not even know it. It would not be for years later that God very patiently, very carefully led me to discover the truth for myself. The thing which helped me see my errors more than anything else was my respect and love for the scriptures and an understanding that they are the only reliable authority. I decided, I could not rely on my feelings, emotions or experiences, no matter how real they were for me. They are not my source of religious authority. I had to put a lot of things behind me and be open to the possibility that I had been wrong. When someone showed me what the Bible actually taught about the plan of salvation, it was so obvious I accepted it quickly and immediately obeyed it, but I did not stop there. I carefully studied everything out for myself and I am still doing so to this very day. I would love to be wrong about all of this and I have tried for 33 years to punch holes in the Biblical Plan in order to make the road just a little bit wider, but the Biblical Plan is too solid, too consistent, too prominent throughout all of scripture and too obvious, once you see it. In the next few lessons, you will see, with absolute clarity, what the Biblical plan of salvation entails and how beautifully it is organized by God and how easily it's seen with the heart of a child. You will begin to feel a fire in your bones and see a future for yourself which is going to get super exciting. Now it's time to dig into the scriptures.